Like other GCC countries, the economy of UAE depends a lot on oil and petroleum exports but the gulf country has diversity in its economy as compared to its neighbors due to its reliance on other aspects of economy also. It is quite evident from the fact that UAE has been placed as among the world’s top ten most business friendly countries in 2017. The country has improved its rank from previous year as it was at 15th spot in 2016. UAE achieve this status by providing opportunities and lucrative incentives to start businesses in the country. 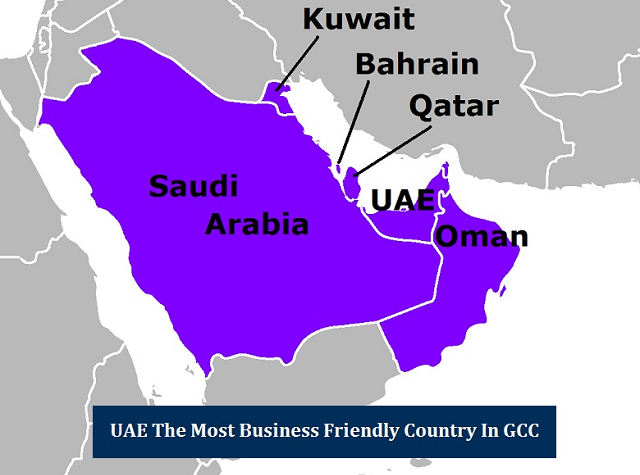 Following are top reasons that distinguish UAE from other GCC countries for being the most business friendly country in the area. Gulf countries are quite tentative to provide free business opportunities to foreigners and the foreign shareholders are required local sponsors to start business in the GCC countries. UAE has the same rule in which the local sponsor is the shareholder of 51% shares while the foreign investor can have 49% shares in the company. Such thing is discouraging for foreign investors. But UAE has tried to minimize the effect of these restrictions with the formation of more than 40 free zones in the country. These free zones are present in all the 7 states of UAE while Dubai and Abu Dhabi contain most of these free zones. In these free zones, local sponsorship is not required at all and the foreign investors have 100% shares of their companies. Along with that, there are no taxes and duties on the businesses. Many world renowned companies and business chains have shifted their offices from well-developed western countries to UAE in order to gain maximum benefits of these free zones provided by UAE. These free zones are important factor that has taken UAE to a business and commercial hub among all the GCC countries. UAE is among few GCC countries that provides offshore banking facilities for foreign investors. This offshore business facility provides all the benefits of free zones while they have their unique benefits also like no need to establish a physical company and opportunity to remit all of your income back to your home country. These offshore business opportunities are so profitable that wealthy people from all around the globe like to bring their wealth in UAE and enjoy benefits and profits of the opportunities provided in the offshore companies of UAE. Free zones and offshore areas are heaven for foreign investors but the investors can also get favorable business opportunities in UAE mainland despite few restrictions like local sponsorship. The investors have the opportunity to start wide range of businesses in mainland UAE whereas most of the free zones are restricted to specific types of business. Free zones are also present in very limited and remote areas while there is a large area adjacent to the population where investors can get build business setup in the UAE mainland. The UAE government also provides several incentives to businesses in the mainland UAE like zero corporation tax, no audit requirement, no currency restrictions, 100% repatriation of capital and profits etc. UAE has the best rail, road and aviation infrastructure in the entire GCC. Currently, all the major cities of UAE are connected with road networks. The rail network of the country is also improving as all the major cities and ports will soon be connected with the completion of 1200 km under construction railway project. UAE has world’s best airlines, Emirates and Etihad, while the world class airports in the country receive air traffic from all major world airlines. There are several seaports in UAE that are used to import and export goods from other parts of world. All these factors play an important role in economic growth of the country. UAE provides best tourism opportunities and picnic spots as compared to all GCC countries. There are skyscrapers like Burj Khalifa, number of beautiful and unique artificial islands, cultural centers and museums in all the states of UAE. Apart from these picnic places, there is also a good shopping opportunity in UAE as many famous international companies have their stores in UAE due to business friendly policies of UAE government. The country also hosts several world fame sports events and people from all around the world visit UAE to view their favorite players in action. All these factors are making tourism an important economic activity in UAE. UAE is now trying to reduce its dependence on oil and petroleum exports due to continuous reduction of oil and petroleum prices. But there is no doubt that exports of oil and petroleum products still play an important role in the financial budget of the gulf state. Currently, exports of oil and petroleum products form major portion of economy of Abu Dhabi and all the other Emirate states except Dubai. The share of oil exports was 77% of the state budget of UAE in 2011 while it still comprises 25% of the budget of UAE.